As we enter the final weeks of the election, we need to get on the same page about the work we have to do to win. The Plan to Win Tour is a series of regional volunteer trainings where we will walk through our campaign strategy and pathway to victory in detail. 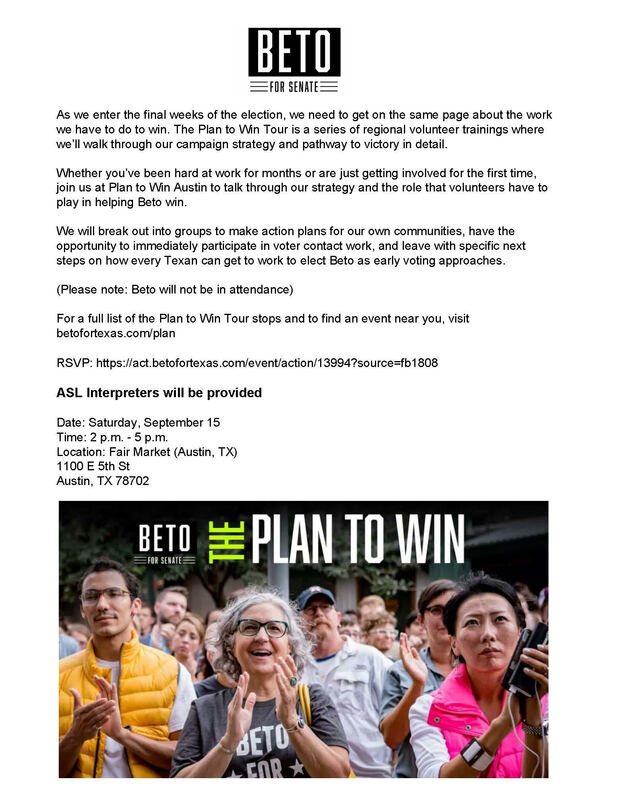 Whether you’ve been hard at work for months are just getting involved for the first time, join us at Plan to Win Austin to talk through our strategy and the role that volunteers have to play in helping Beto win. We will break out into groups to make action plans for our own communities, have the opportunity to immediately participate in voter contact work, and leave with specific next steps on how every Texan can get to work to elect Beto as early voting approaches.